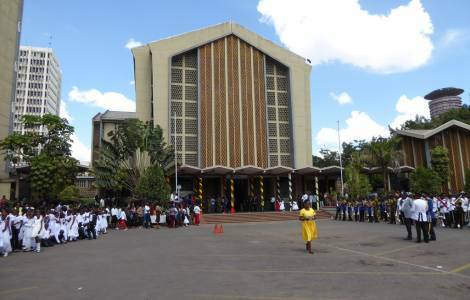 AFRICA/KENYA - The Bishops: "Unemployment is a time bomb that can explode at any time"
Nairobi (Agenzia Fides) - "A step forward in the right direction, but must be accelerated in order to reach a meaningful and lasting reconciliation", say the Bishops of Kenya in reference to the meeting on March 9th between President Uhuru Kenyatta and the leader of the opposition Raila Odinga, aimed at overcoming the tensions for last year’s disputed presidential elections (see Fides, 12/3/2018). In the statement published at the end of their Plenary Assembly, the Bishops hope to establish an "all-inclusive round-table Conference that will iron out all the differences that have been separating Kenyans". The Bishops hope, among other things, to transform the Presidency into an institution that "is above political parties, so that it is not a position of power struggle, that is bitterly contested as it has happened in the 2007 and the 2017 presidential elections". In 2007, in particular, the protests degenerated into violence that lasted a few months with thousands of deaths and about one million displaced persons. However, the Episcopal Conference is said to be "very upset that some section of politicians are endlessly in campaign mode, and are now obsessed with the coming 2022 elections instead of focusing on solving the pertinent issues affecting Kenyans". The Bishops also criticize corruption, nepotism and tribalism, widespread ills especially at administrative levels of counties. "The devolution of powers is a good thing if there are good administrators", they say. "We know of serious leaders who want to bring meaningful changes and are keen to use the available resource for the good of all the people in their respective counties. Unfortunately there are those who are there to loot, plunder and steal the money allocated to their respective Counties". "Some Counties practise open tribalism hence perpetuating this vice that is destroying our Country. In these counties only people from the dominant tribe are employed. It is no longer about service delivery and professionalism but “our turn to eat”. County governments must be held accountable for the money they have received and have not been utilized for the purpose intended". Corruption exacerbates the Country's heavy economic conditions, which result in a high youth unemployment rate, defined by the Bishops as "a time bomb that can explode at any time". "Out of desperation many young people end up joining gangs, militias and terror groups while others are caught up in drugs, substance abuse and alcoholism, as they waste their lives". "Job creation should be top on the agenda of any Country", they say. "Kenya is an agricultural Country and therefore more resources should be allocated to farmers to work the land and produce food. It is very sad to see farmers frustrated because of the low prices for their produce. We have seen how, instead of buying from the farmers, cartels are allowed to import the same produce from outside, thus killing the efforts of our own people. We call upon the government to protect the Kenyan farmers".